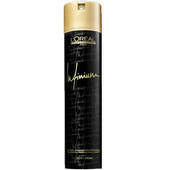 L'Oréal Professionnel Infinium is the complete series of perfect high-tech hair sprays, especially created for hairdressers working backstage on fashion shows. This means high fixation, amazing shine and ultra-dry formula without stiffness, to any of the latest hairstyle trends. Whatever runway trend you want to achieve, we have a hold level for you. Choose from 4 hold levels: Infinium Soft, Infinium Strong, Extra Strong and Extreme.